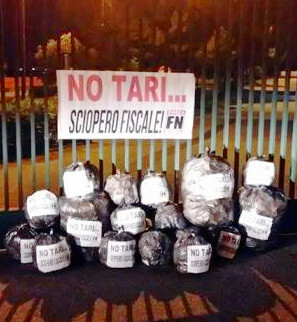 Forza Nuova activists in Lamezia Terme piled trash bags at the city gates under a sign reading “No Tari — Tax Strike!” They are protesting a new tax on garbage collection. Twenty war tax resisters in the Canary Islands redirected €2,000 from the military to alternative projects. The Association of Catalan Municipalities and the Association of Municipalities for Independence are launching a campaign to get local government bodies in Catalonia to pay their federal taxes to the Catalan regional government rather than to the federal government. This is currently mostly a symbolic gesture, as the Catalan government is forwarding such payments along to the central tax administration, but the groups see this as a way of laying the groundwork for independence and as giving the regional government financial leverage in its fight. They also hope that by convincing local governments to do this they will also encourage people and businesses to follow suit. The Knowckers.org site has tried to tally up how much the Bonnets Rouges movement cost the French government during its successful campaign against the highway tax, and to explain the cross-ideological appeal of the movement. Tax season has come to a close in Asturias, and for war tax resisters there it climaxed with a demonstration and blockade of the tax office in Xixón. Poujadists Plan to Refuse Any Tax Increases. Paris, July 13 . (Reuters) — Members of Pierre Poujade’s anti-tax movement decided today to harden their attitude and refuse to pay tax increases. The movement’s newspaper, Fraternité Française , said the movement’s administrative council decided on “absolute opposition” to tax inspections of shops’ books as well as “absolute refusal” of increases. The Poujade movement of shopkeepers and small businessmen, opposes what it calls abuses of the taxation system.